Elon Musk's midnight cherry red Tesla Roadster is seen before being enclosed in a payload fairing for SpaceX's first Falcon Heavy rocket launch, slated for January 2018, in this image released by Musk on Dec. 22, 2017. 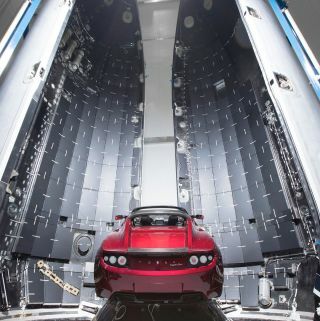 "The payload will be an original Tesla Roadster, playing 'Space Oddity,' on a billion year elliptic Mars orbit," Musk wrote in the post, which he titled: "A Red Car for the Red Planet." Robert Pearlman is a contributing writer and the editor of collectSPACE.com, a Space.com partner site and the leading space history news publication. Follow collectSPACE on Facebook and on Twitter at @collectSPACE. Follow us @Spacedotcom, Facebook and Google+. Original article on Space.com .